Russian President Dmitry Medvedev has described his Georgian counterpart as a "political corpse", saying Moscow does not recognise him as president. "President Saakashvili no longer exists in our eyes. He is a political corpse," he told Italy's Rai television. He said US support for Mr Saakashvili had helped provoke the crisis, which has seen Russian troops invade Georgia. He said Russia did not fear isolation by Western countries that have condemned the Russian intervention. 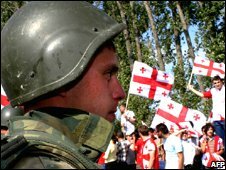 Fighting between Russia and Georgia began on 7 August after the Georgian military tried to retake the breakaway region of South Ossetia by force. Russian forces launched a counter-attack and the conflict ended with the ejection of Georgian troops from both South Ossetia and Abkhazia. Russia has since recognised the independence of both regions, though no other country has. The Russian president blamed the US for helping provoke the crisis by supporting Mr Saakashvili. "Unfortunately, at a certain point they gave Saakashvili carte blanche for any actions, including military," said Mr Medvedev in the Rai interview. In a broadside aimed at international calls for Russia's isolation, he said Moscow did not fear being expelled from the G8 group of rich nations nor did it fear Nato cutting ties with his country. He said Nato had more to lose than Russia by a severing of relations. 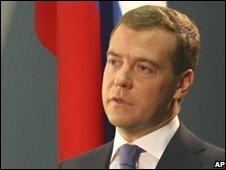 Earlier, Mr Medvedev had mixed praise for the European Union, which on Monday decided to suspend talks on a strategic pact with Russia until its troops were withdrawn from Georgia, but declined to impose sanctions. Prime Minister Vladimir Putin, who stepped down as president earlier this year, praised the European Union's "common sense". But he warned that Moscow would respond to the growing presence of Nato warships in the Black Sea, where Russia's navy fleet has a huge presence. He did not give any details.